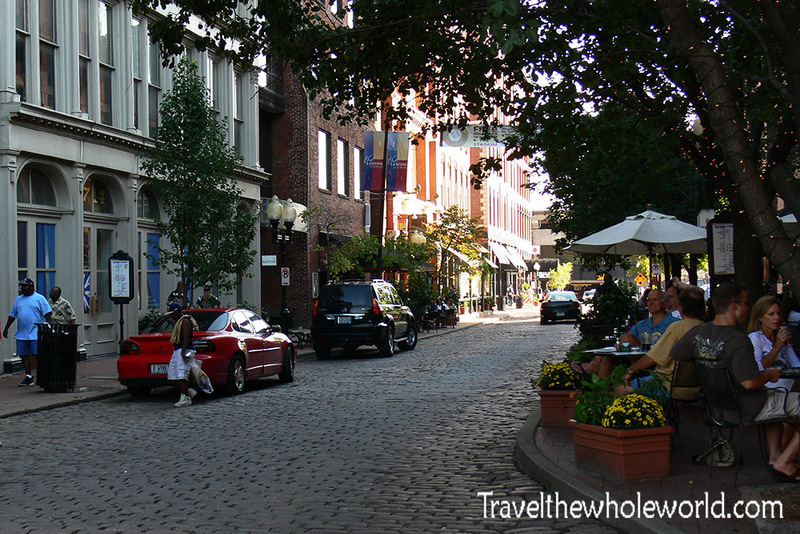 Located right in the heart of America, Missouri is a state that is a mix of both southern and mid-western culture. Missouri has a pretty big population, with the majority of its citizens living in one of the two famous cities of St. Louis and Kansas City. In the 19th century Missouri became the gateway to the west, where most settlers began their journeys to head to other states such as Oregon or California. Missouri was also the beginning of the famous Lewis & Clark Expedition. 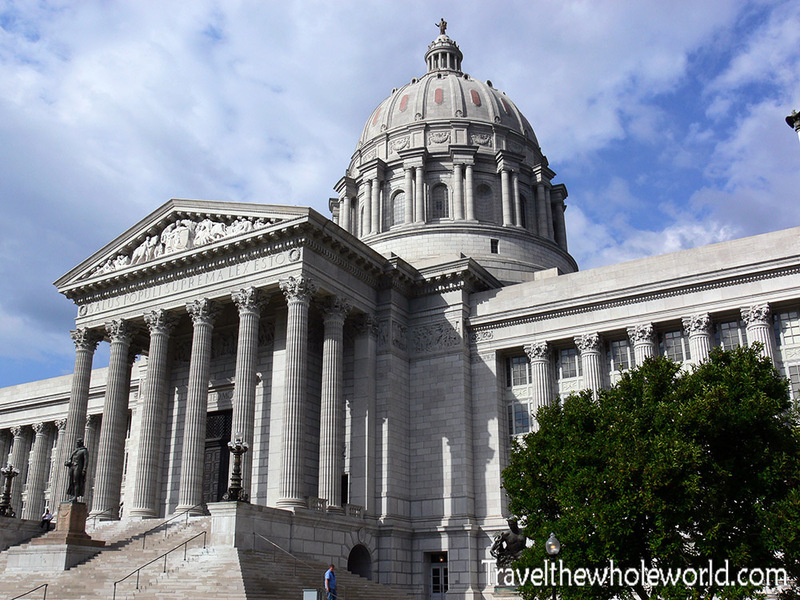 Most Americans like myself, probably have never heard of Missouri’s capital of Jefferson City. It’s a pretty small city, although not the smallest capital city in the United States. I wish I had done more in Jefferson City but mostly was just passing through. The city was actually voted by the publishing company Rand McNally as America’s most beautiful small town, so it appears I’ve missed out! Really the only thing I did here was visit the capitol building, since I want to visit all of them in the United States. 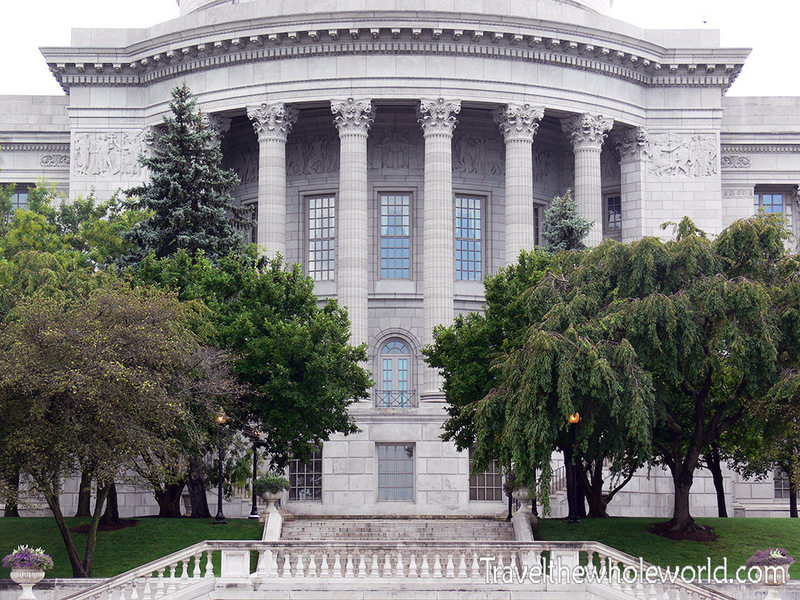 The photo above shows the front of the capitol building with its backside below. 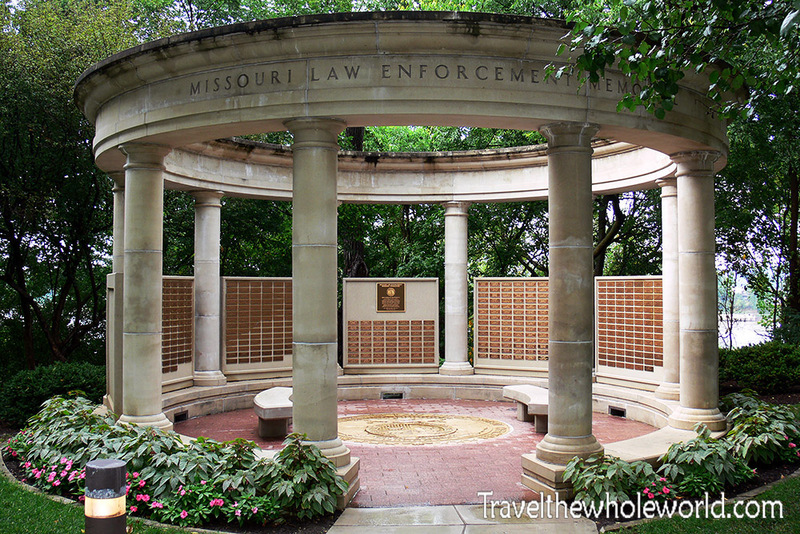 I did also visit the Law Enforcement Memorial on the state capitol grounds in Jefferson City. It’s a beautifully designed memorial and easily caught my attention. Built in 1994, the memorial serves for all the police officers who have lost their lives in the state. I visited Missouri earlier in my domestic travels, long before the Black Lives Matter movement began. My first real stop in Missouri was to Kansas City. Beyond the name, I knew nothing about the city was ended up being pretty impressed. 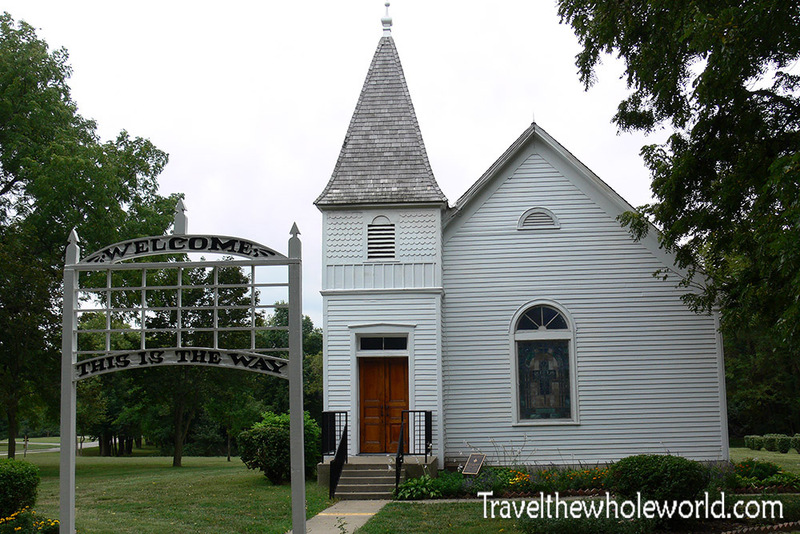 The city is fairly large for a place out in the middle of the country and certainly has a lot to do. The photo above shows some of the large skyscrapers in the city center. I took the skyscraper photo while visiting this enormous memorial above. 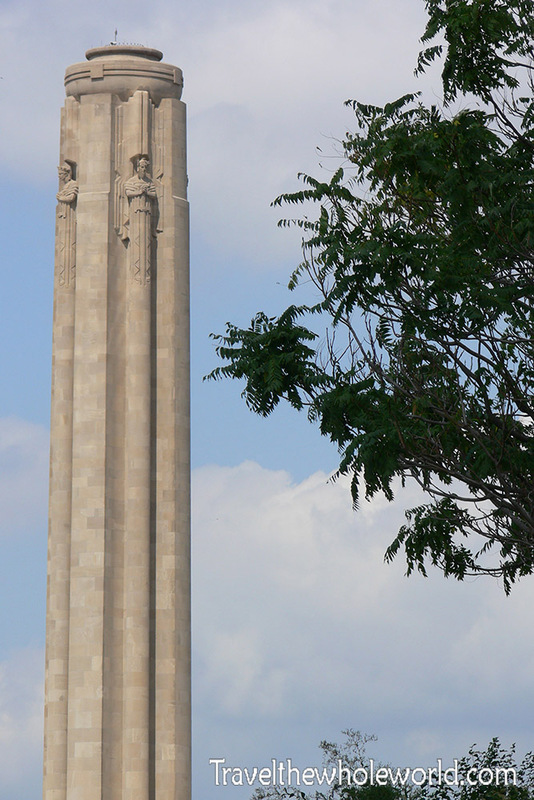 Known as the Liberty Memorial, it was dedicated to World War I veterans and is also home to the World War I museum. It was dedicated in the 1920’s by President Calvin Coolidge, so this impressive memorial is almost a century old! 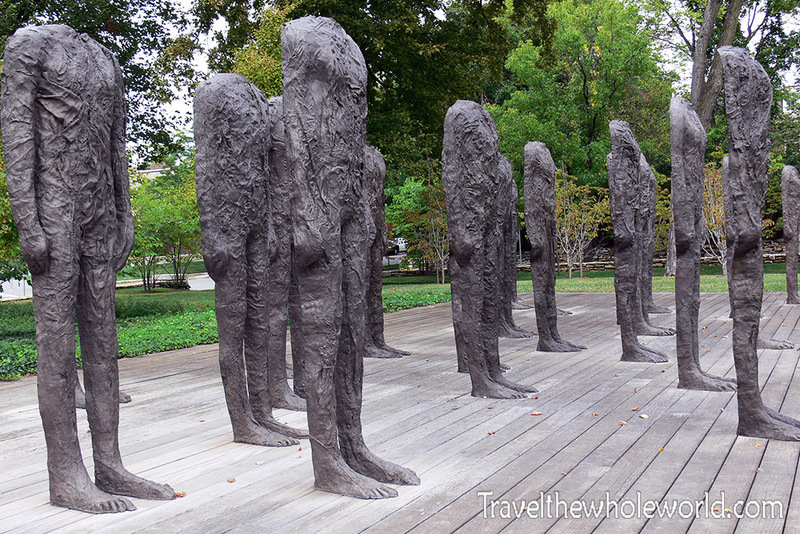 Another famous museum is the Nelson-Atkins Art Museum which is just a few miles south of the Liberty Memorial. 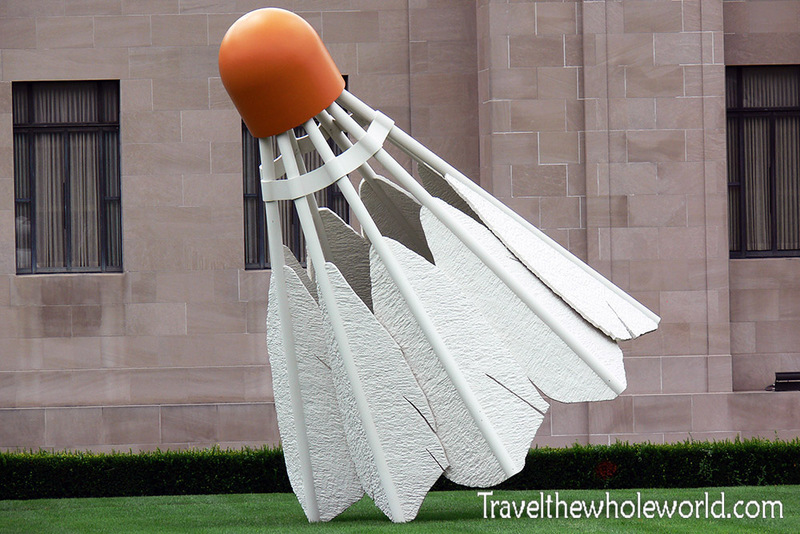 The Nelson-Atkins Museum is considered one of the best art museums in the United States. The strange headless people above and the large steel shuttlecock below are on the Museum’s front lawn. Another failure of mine, I didn’t go inside the museum since I had preferred to be outside at the time. I’ll definitely make up for this during my next visit to Kansas City! 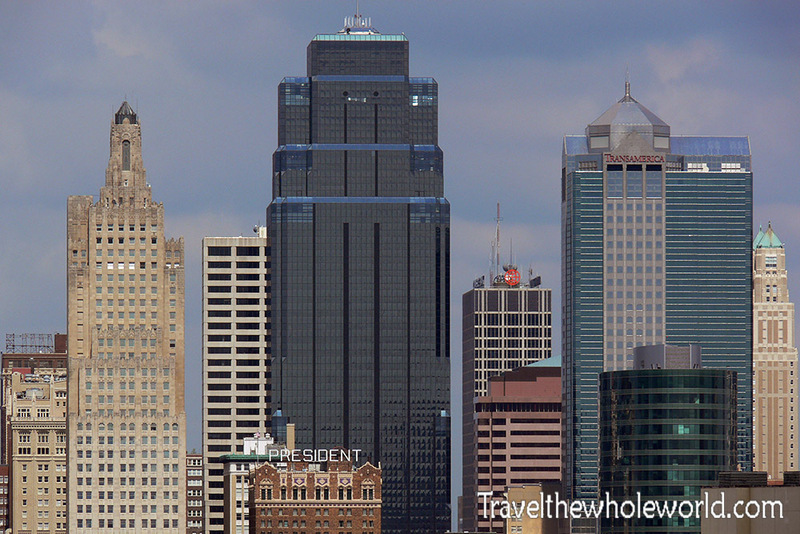 In addition to its museums, Kansas City is known for two other facts. The city is number two in the world for having the most boulevards, second only to Paris! 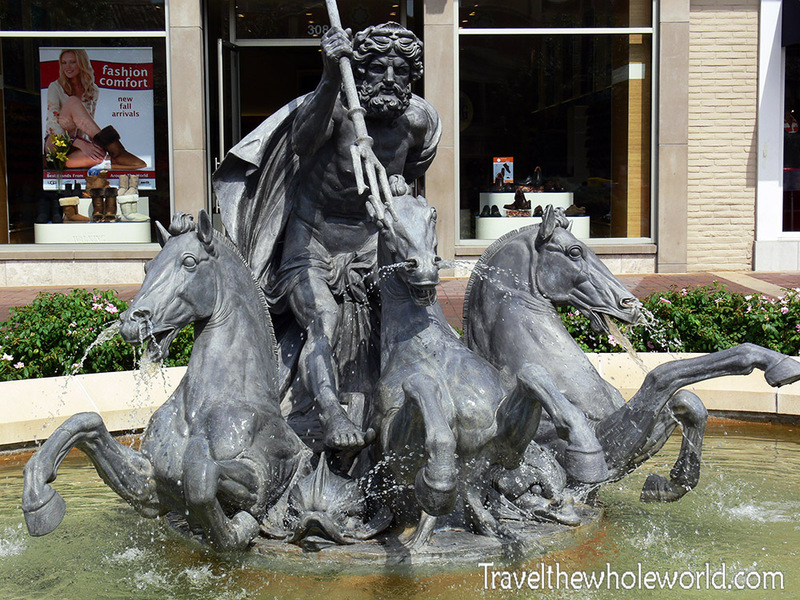 In addition to that, it has more fountains than any other city in the world with the exception of Rome. I would have never imagined Kansas city of all places to hold these titles! Above is another random fountain that I photographed while walking through the city. 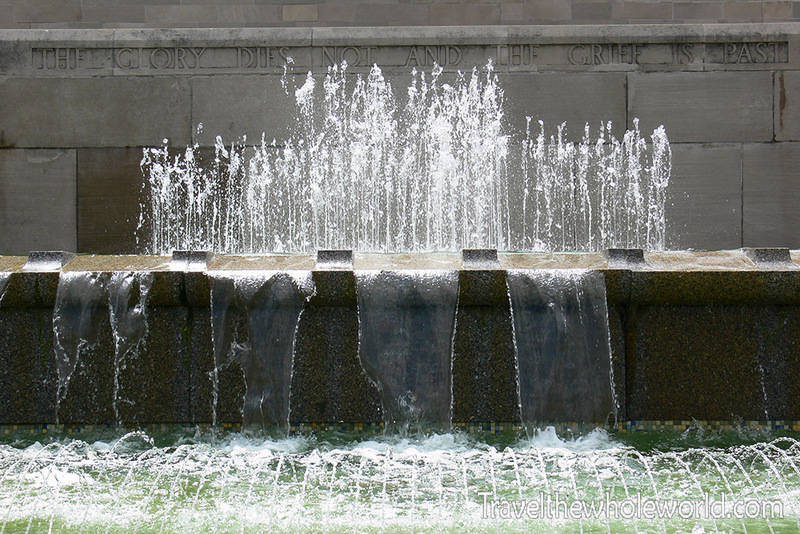 The two fountain photographs I posted on my site are by no means impressive. There’s a large variety of them in the city and the most beautiful ones can be seen at night. 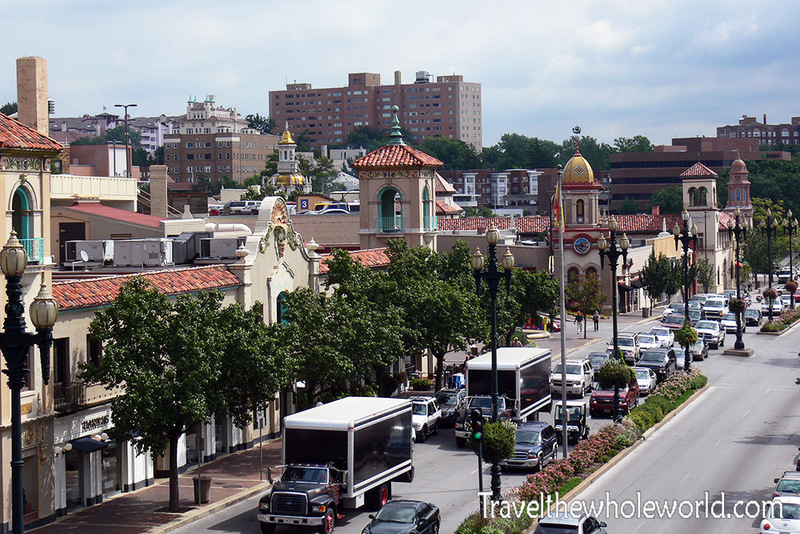 A popular place to visit in Kansas City when looking for shopping or nice restaurants is the Country Club Plaza. The plaza was built in 1923, so you can imagine back then it was certainly a modern luxury at the time. 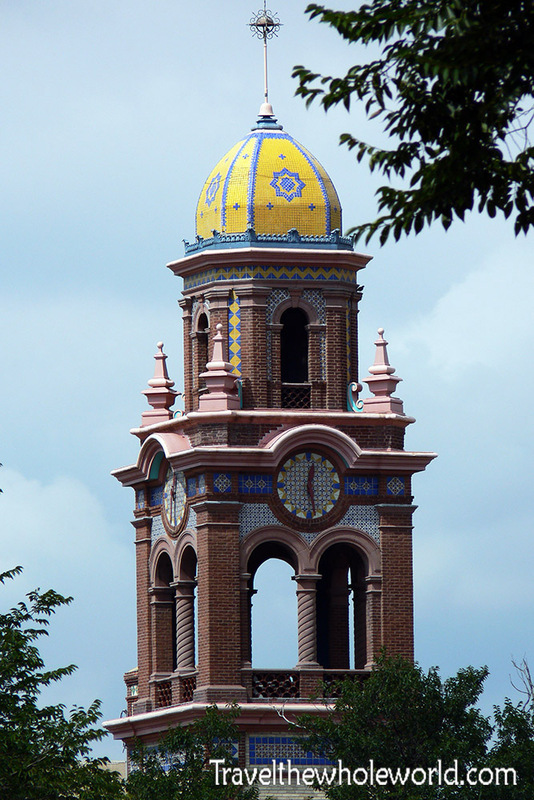 As a matter of fact, Country Club Plaza boasts being the first plaza in the world that was designed to accommodate automobiles! The plaza is filled with expensive upscale restaurants and exclusive stores that take over some 55 acres. In the center of the plaza flies the Spanish flag, as everything here was modeled after Seville, Spain. Lots of the architecture was influenced by Spanish cathedrals, which I found much more interesting than the shopping. 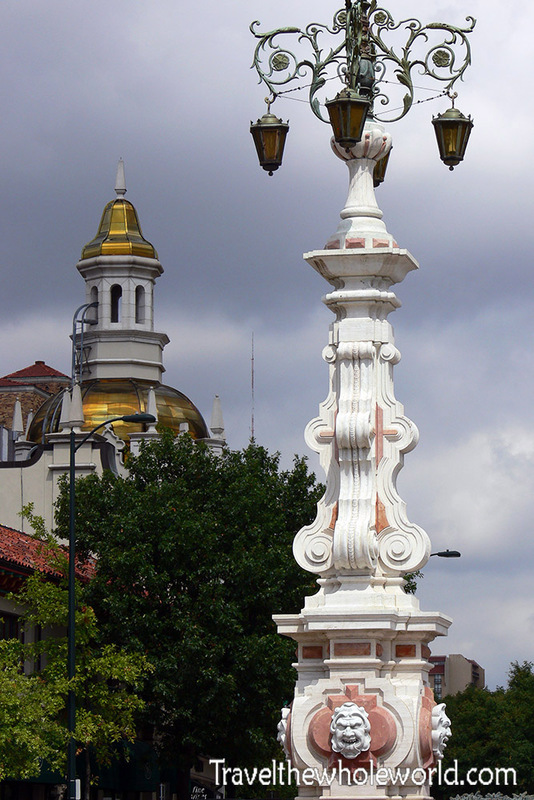 The photo above shows one of the elegant lamp posts in Country Club Plaza, and in the photo below you can see some of the Spanish influenced architecture. After Kansas City, St. Louis is the next biggest city in Missouri. The Lewis & Clark Expedition was the first American or western expedition to reach the Pacific Ocean and return. 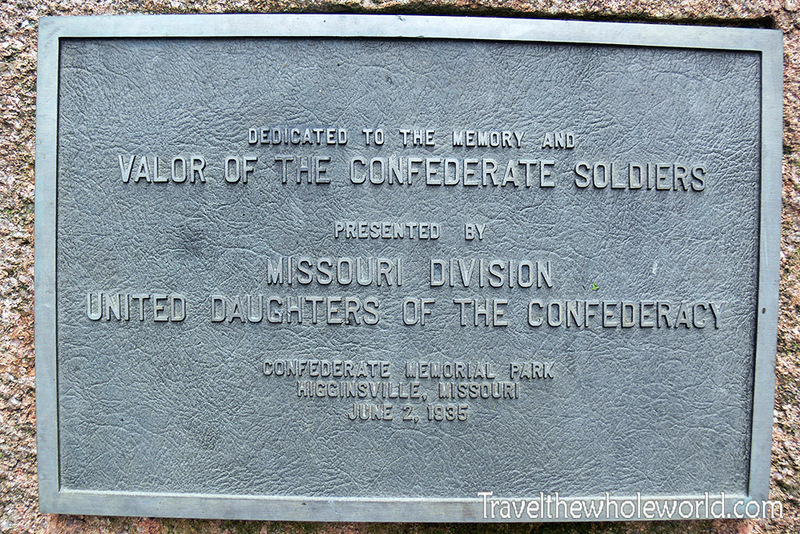 It was an incredible achievement at the time, and their adventure began right here in St. Louis Missouri. After their success, many settlers heading west also began their journey from St. Louis. 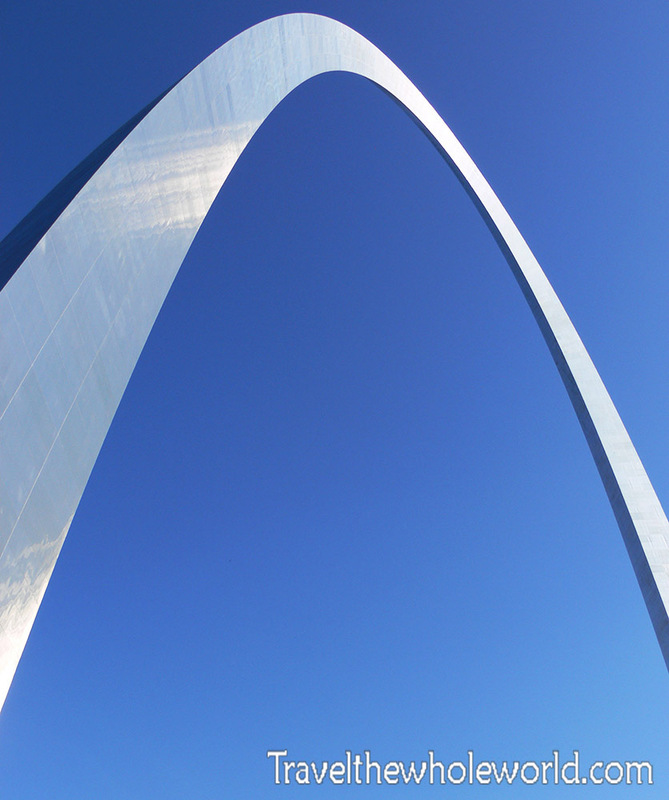 The city became known as the gate way to the west, and was honored with its famous Gateway Arch photographed above. This impressive arch is over 50 years old already, and rises 630 feet (192 meters). Despite how thin it looks, the interior of the arch actually has elevators and people can ride to the top. Sounds scary! 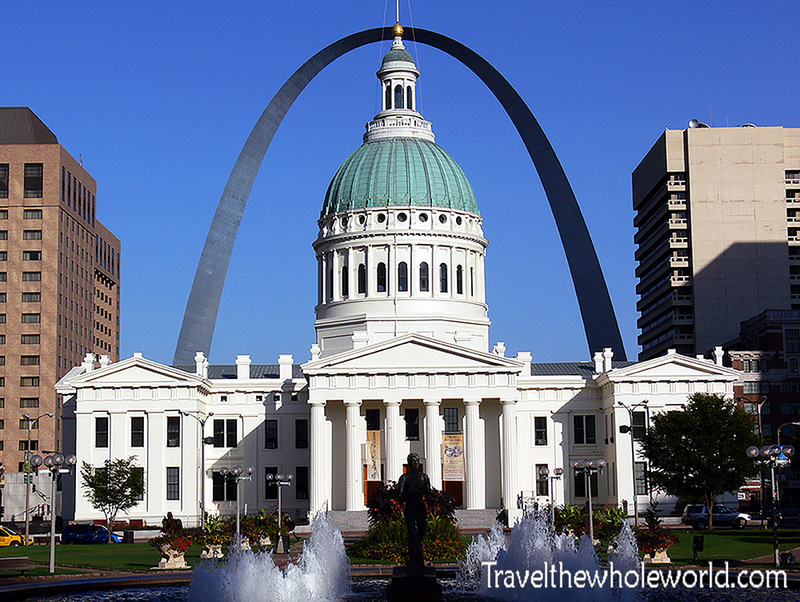 Another famous landmark in St. Louis is their Old Courthouse. With the Gateway Arch right behind the courthouse, I think the two easily make this one of the most beautiful city views in the state, if not the entire mid-west! Back in 1857, the famous court case of Dred Scott was held here. Dred Scott was a slave who tried to sue the United States for his freedom, arguing that he had lived in other states where slavery was illegal, therefore he and his family should be freed. Dred Scott lost his case, after the Supreme Court argued that he was not a considered a citizen of the United States and therefore his residence was irrelevant. It’s amazing how things used to be only 150 years ago. Sadly Scott died before the civil war and never got to see the nation freed from slavery. On my next visit to the city, I will make sure to visit his grave which was rediscovered 99 years after he passed away. I’m not sure how this happened, but somehow I left St. Louis with only four photos! The only other two I captured was a photo of a popular neighborhood known as the Riverfront in St. Louis. I came here to have a late lunch, and most of the restaurants and bars were packed with people grabbing drinks and watching a football game. 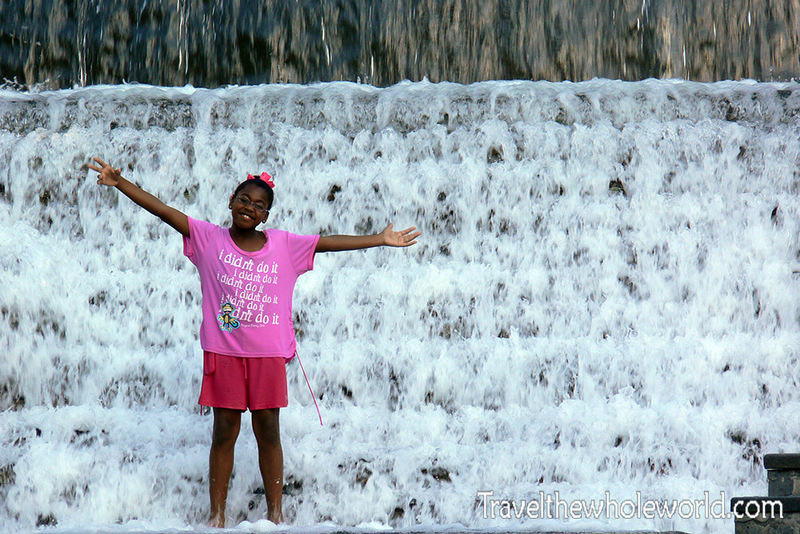 And while St. Louis doesn’t have nearly the same number of fountains as Kansas City, it still has enough to keep the population cool in the hot summers! After St. Louis I mostly visited small towns and some rural areas. 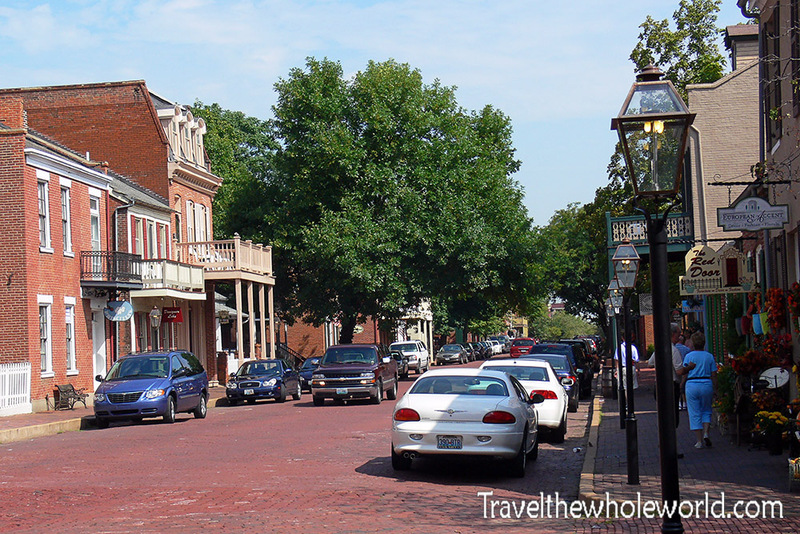 My next stop St. Charles which was founded in 1765 and was Missouri’s first capital. 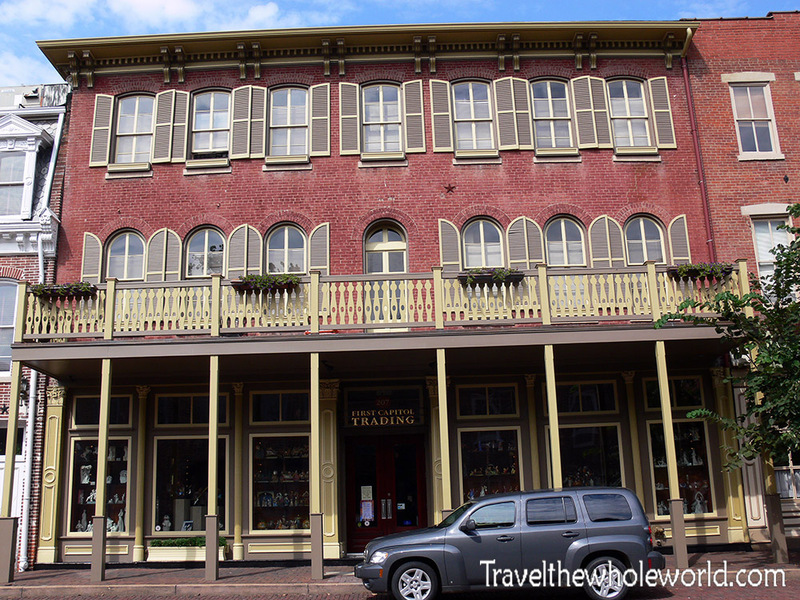 St. Charles is also America’s second oldest city west of the Mississippi River. When the Lewis & Clark Expedition headed out west, St. Charles was their last stop in civilization, afterwards it was nothing but the great outdoors until they reached the Pacific. Today St. Charles still has that old town atmosphere, and is the location of many large festivals, including one of the largest Christmas festivals in the United States. Right outside the city is one of Missouri’s largest casinos, the Las Vegas owned Ameristar. The surrounding four photos are all from Old St Charles. 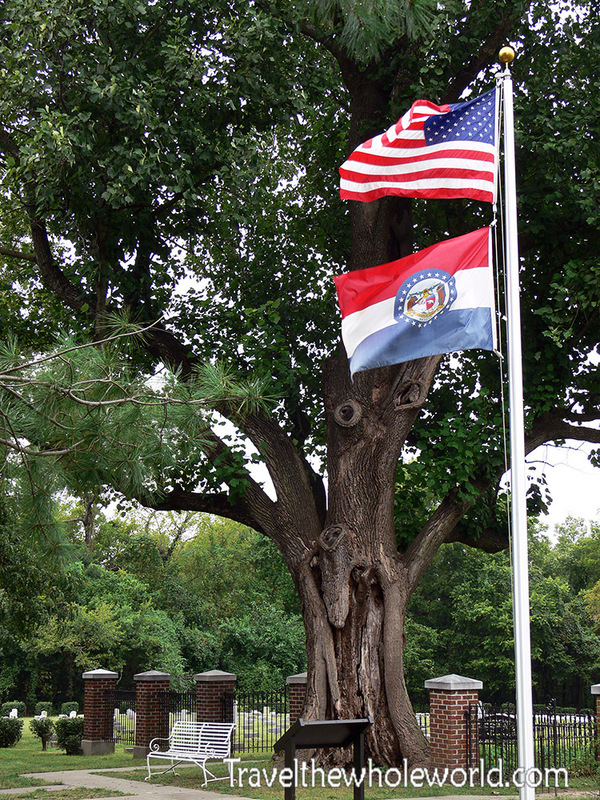 Since Missouri hasn’t even been a state for 200 years, its history focuses around the Lewis & Clark expedition and the state’s Civil War history. When the civil war skirmishes first started out east, to Missouri these incidences were a long way from home and had little effect on daily life. It was only a matter of time however, until the war reached the Midwest. In 1861 a small Confederate army left the city of Lexington because of advancing Union troops. The Confederates fled south and after regrouping, they marched back to Lexington with an 18,000 strong force for the Battle of Lexington. The photo above shows a small church in Lexington with its Civil War cemetery below. The battle of Lexington lasted a few days with a Confederate victory. The Union loss did not stop them from doing further attacks in Missouri and it was only the first of many major battles to come. Surprisingly, the state of Missouri was the location of almost 1,000 battles Civil War battles; only Tennessee and Virginia had more. 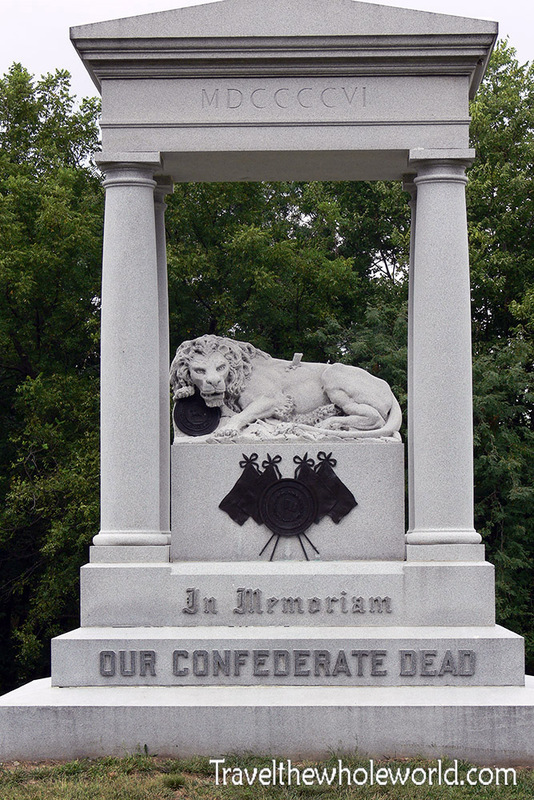 The photos above and below show parts of the memorial that was dedicated to Confederate troops. The rest of my Missouri trip was exploring the outdoors. Missouri isn’t a well-known outdoor destination as it’s relatively flat, but they do have a few great places. 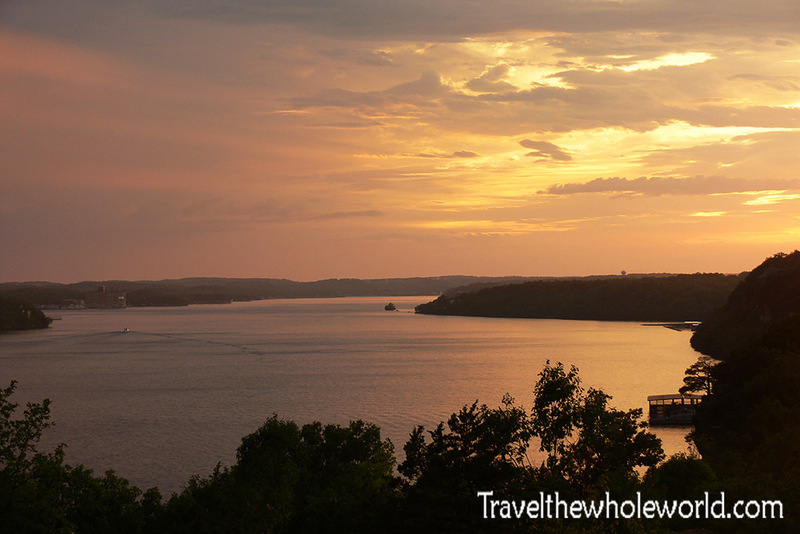 The Mississippi River forms the eastern border of the state along with Illinois, while in the central and southern regions you have the Ozarks. The Ozarks continue into Arkansas where I did some hiking. In the Missouri side I went to the Lake of the Ozarks. The lake looks more like a massive river, especially when viewed from a map. With all its channels and depth, it gives a lot of opportunities for water sports and a haven for wildlife. The photo above was taken from one of the lake’s shores. Hiking in the Ozarks was very rewarding. The only drawback was the constant rain and extreme humidity when I was there. On a clear day it would be much more enjoyable, but still I came across some wildlife and scenic views. Above what I believe to be a three-toed box turtle. 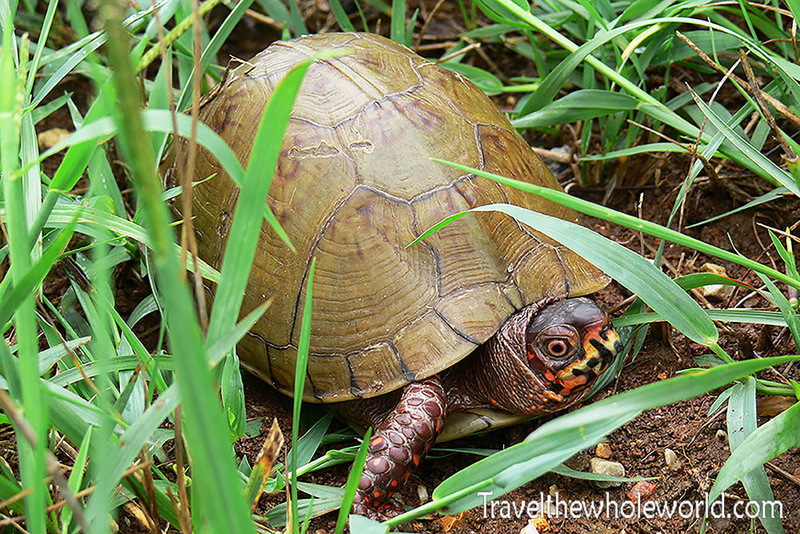 Box turtles live all over the United States, and are pretty common pets. I don’t believe I’ve seen this species before but had owned an eastern box turtle when I was little. 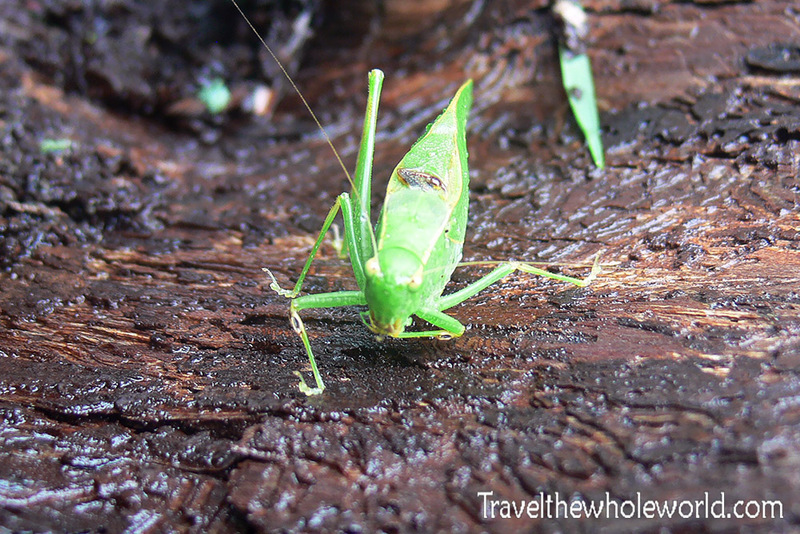 Below is a large katydid which was eating something off a piece of bark on the forest floor. 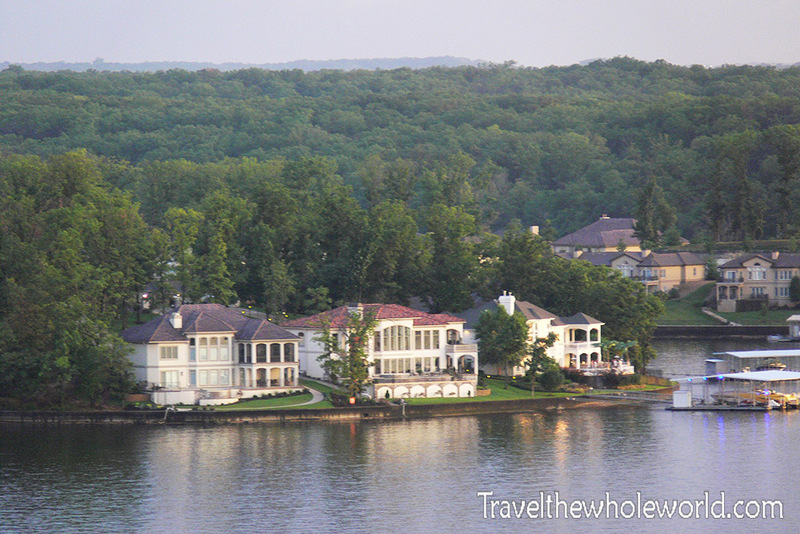 The lake of the Ozarks are pretty diverse in terms of the type of communities they have. There are some rural areas as well as cities and even a few “beaches”. The photo above shows some of the incredible mansions built along the lake. Other areas like in the photo below have a more beach like atmosphere. 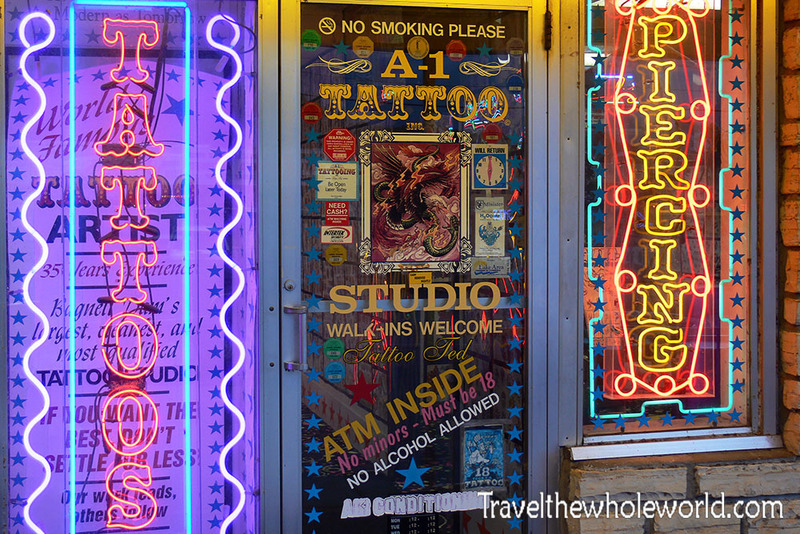 Here you can find bumper cars, tattoo parlors, arcades and other similar places. The one beach I went to was Osage beach, but it was raining heavily so it was deserted! As I headed farther south into the Ozarks the landscape became more interesting and cliffs and small mountains began to appear. I headed to a place called Elephant Rocks. The photo above shows what the woods look like. 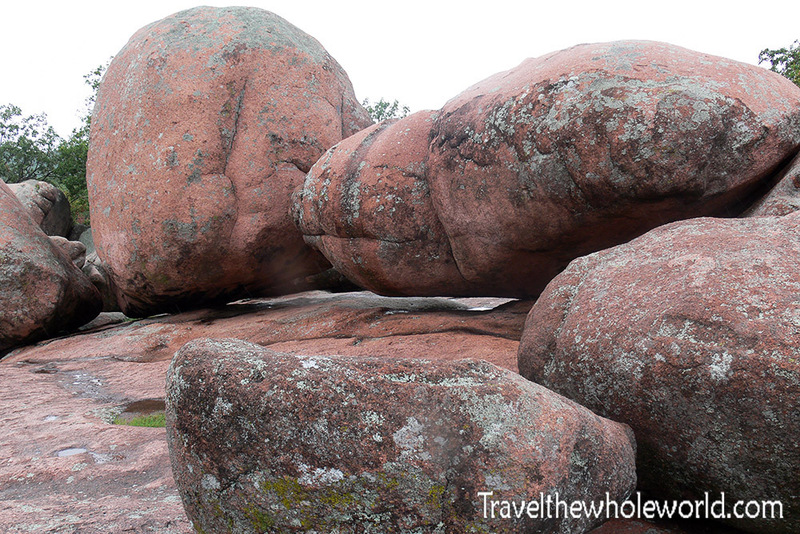 You can see the ground is covered by large boulders, unlike the rest of the state. 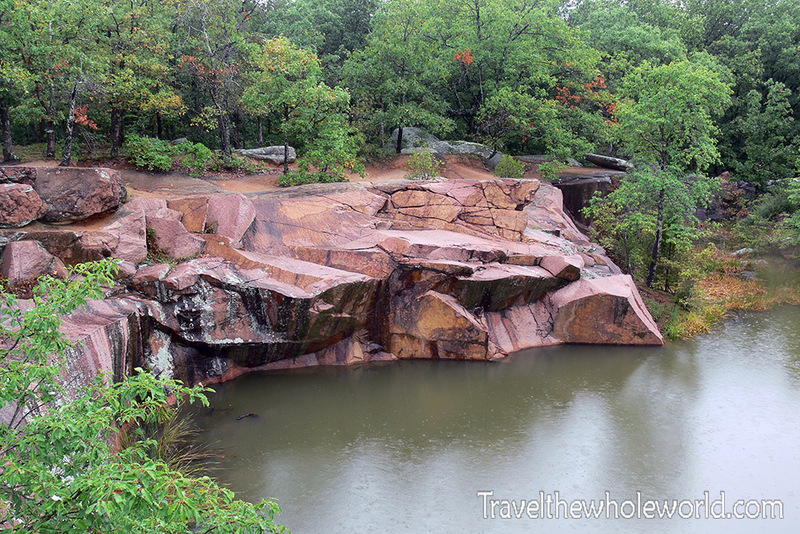 I continued to have some rain and overcast when I visited Elephant Rock state park. I think as far as nature goes, this was definitely the most scenic part of Missouri that I visited. This one above is the largest rock in the state park and is known as Dumbo Rock. It’s estimated that this rock alone weighs an incredible 1.3 million pounds, (600,000 kilograms)! 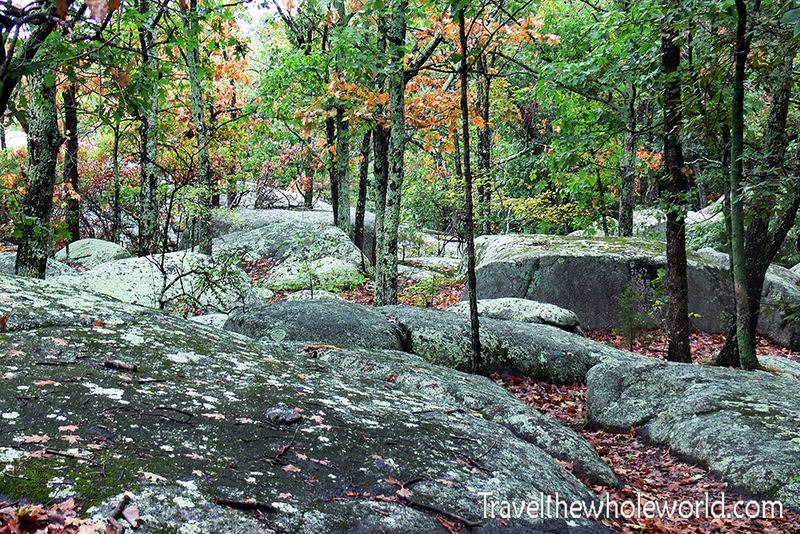 Aside from the scenic parts of Elephant Rocks, the area also comes with some history because it was a 19th century rock quarry. The pond below is a result of rainwater filling the quarried areas. 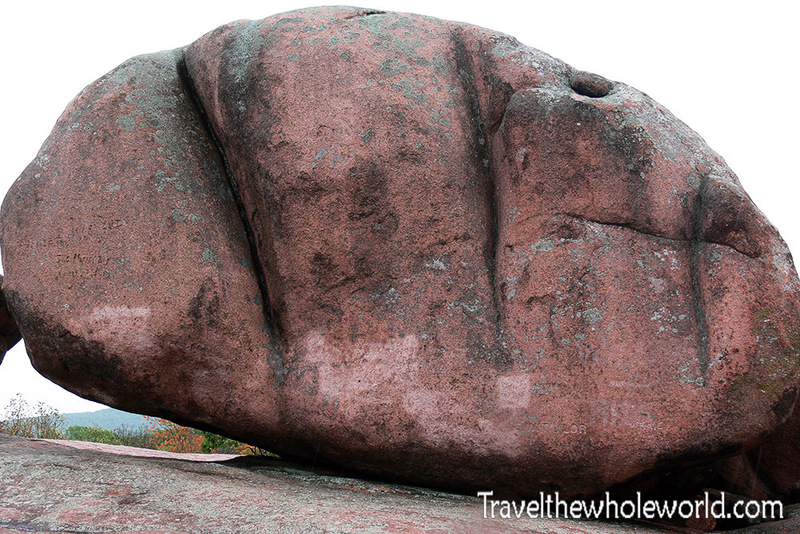 Most of the red granite rock was used in St. Louis, but some of it made it as far as California or Massachusetts. Lastly, both these lizards where seen in Elephant Rock state park. 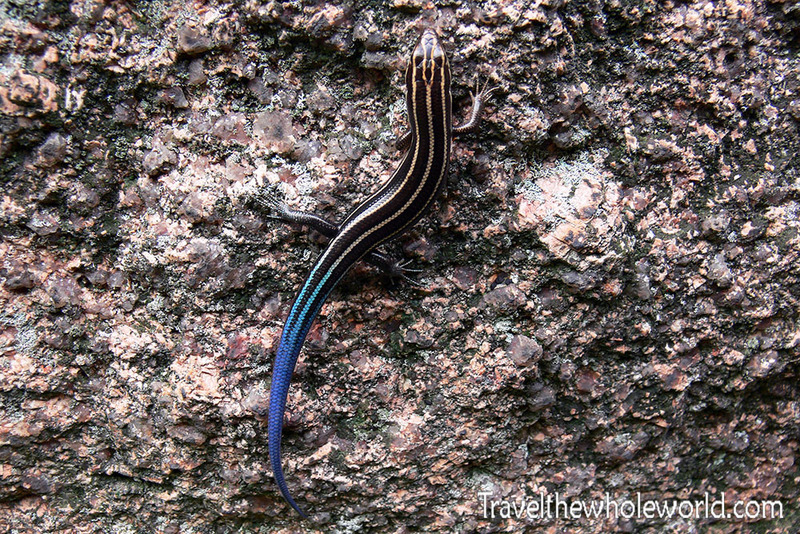 The one above is my favorite lizard in the United States; the five lined skink also known as the blue tailed skink. This one photographed is a juvenile, as they sadly lose their bright blue tail as they get older! I have seen some growing up in Virginia, but it was probably a decade since I had lost saw one. 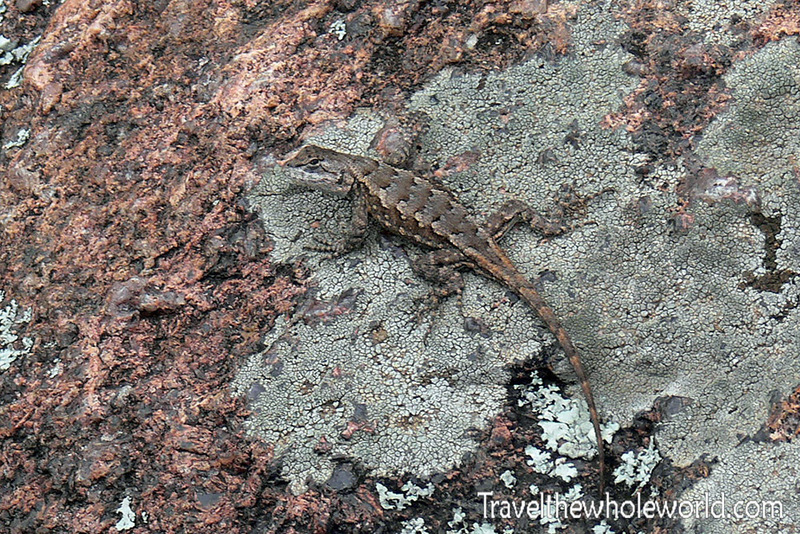 This lizard below was less obvious with his great camouflage that helped him blend in with his background.